NZD/JPY is moving in an uptrend by forming Higher Highs and Higher Lows in H4 Chart. Market broken the top level of the range, re-tested the breakout level again and starts to bounce back with more number of Buyers pressure. 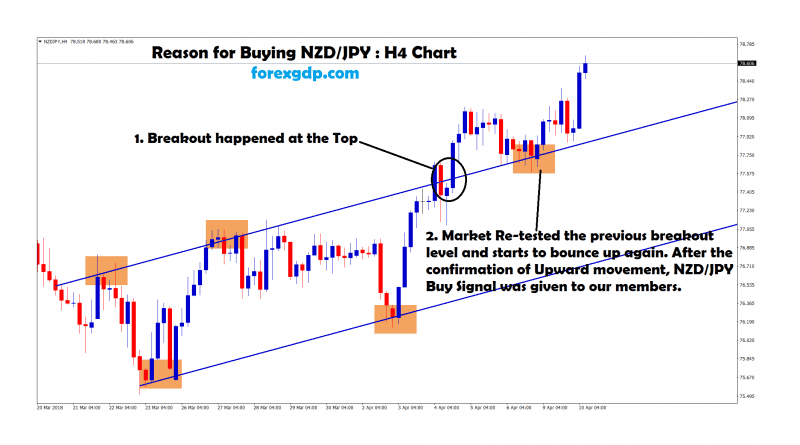 After the confirmation of Upward movement, NZD/JPY Buy Signal was given to our members. NZD/JPY reached our Profit Target Successsfully. After Market Breakout from the range, If market Re-test the previous Breakout level and starts to bounce back, then we can expect big and sharp movements from that Breakout level. This is what happened in this NZD/JPY Buy trade.